In this lesson you will learn some basic history about cameras and how they work. A camera is an optical instrument that records images that can be stored directly, transmitted to another location, or both. These images may be still photographs or moving images such as videos or movies. The term camera comes from the word camera obscura (latin for "dark chamber"), an early mechanism for projecting images. The modern camera evolved from the camera obscura. How a camera obscura works: Light from a real object enters a dark room or box through a small hole. An inverted image of the object is created on the wall opposite the small hole. A smaller hole results in a sharper, but dimmer. Principle of a pinhole camera: light rays from an object pass through a small hole to form an inverted image. The history of the camera can be traced much further back than the introduction of photography. Photographic cameras evolved from the camera obscura, and continued to change through many generations of photographic technology, including daguerreotype , calotypes, dry plates, photographic film, and digital cameras. Daguerreotype: The daguerreotype image is formed on a highly polished silver surface. Calotype or talbotype: is an early photographic process introduced in 1841 by William Henry Fox Talbot using paper coated with silver iodide. Dry plate: is also known as gelatin process, is an improved type of photographic plate. It was invented by Dr. Richard L. Maddox in 1871, and by 1879 it was so well introduced that the first dry plate factory had been established. With much of the complex chemistry work centralized into a factory, the new process simplified the work of photographers allowing them to expand their business. Photographic film: is a strip or sheet of transparent plastic film base coated on one side with a gelatin emulsion containing microscopically small light-sensitive crystals. The sizes and other characteristics of the crystals determine the sensitivity, contrast and resolution of the film. 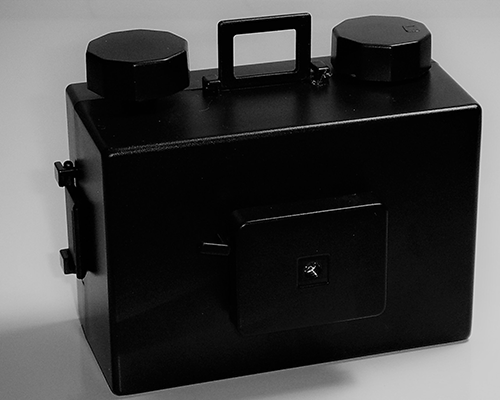 Kodak Brownie box camera, circa 1910 From Wikimedia Commons, the free media repository. From Wikipedia. Who is George Eastman and why did he invent the Kodak camera? George Eastman was born in Waterville, New York and was self-educated. George Eastman invented the Kodak camera because he wanted to capture moments in time. George Eastman was an American innovator and entrepreneur who founded the Eastman Kodak Company, which was one of the first companies to mass produce standard photograph equipment. Eastman patented the first film in roll form or flexible roll in 1884 and in 1888 he perfected the Kodak camera that was the first camera designed for roll film. The use of photographic film was pioneered by George Eastman, who started manufacturing paper film in 1885 before switching to celluloid in 1889. His first camera, which he called the "Kodak" was first offered for sale in 1888. It was a very simple box camera with a fixed-focus lens and single shutter speed, which along with its relatively low price appealed to the average consumer. The Kodak came pre-loaded with enough film for 100 exposures and needed to be sent back to the factory for processing and reloading when the roll was finished. By the end of the 19th century Eastman had expanded his lineup to several models including both box and folding cameras. Digital cameras differ from their analog predecessors primarily in that they do not use film, but capture and save photographs on digital memory cards or internal storage instead. Their low operating costs have relegated chemical cameras to niche markets. Digital cameras now include wireless communication capabilities (for example WIFI or Bluetooth) to transfer, print or share photos, and are commonly found on mobile phones. Also in digital photography, having a camera with a larger number of pixels increases the capability to make larger prints. More pixels generally means higher resolution and higher resolution allows making bigger prints without showing individual pixels. Xcite™ Advertising desires that you enjoyed this lesson on the history of cameras.